An Indian guest at our Hare Krishna center in Boise once told us, “My father was very strict in his daily habits and spiritual practices. He would eat only food cooked by his own hands.” My father, Anantarupa Dasa, has similar remembrances of his grandmother. She would eat only food prepared at home. Many Indians can relate similar experiences with parents, grandparents, or friends. What is the rationale behind a practice so difficult to maintain? Why were members of previous generations so strict in what they ate? The Bhagavad-gita (3.13) gives us a hint: “The devotees of the Lord are released from all kinds of sins because they eat food which is offered first for sacrifice. Others, who prepare food for personal sense enjoyment, verily eat only sin.” At home, “offering food for sacrifice” usually means offering food to whatever deities one worships on one’s home altar. But “offering food for sacrifice” especially means offering food to Lord Krishna, since He is called Yajna (“sacrifice”). And Lord Krishna tells us when He will accept our offering: “If one offers Me with love and devotion a leaf, a flower, fruit, or water, I will accept it.” (Bg. 9.26). The food we eat is important in determining who we are; it influences our consciousness. For example, if we eat bread cooked at a restaurant or factory, the consciousness of those who cooked the bread enters into it and affects us. Slowly, by repeatedly eating the bread, our mentality and desires will become like those of the people who prepared the grains. This principle is not as esoteric as it may seem. When an artist creates a painting, he expresses his thoughts, desires, and emotions through the medium of the art, and the viewer of the painting takes in the artist’s mental state. Similarly, when a computer receives information from outside sources, it may also receive a virus, which—unseen and unheard—slowly destroys the computer’s software. But how can we maintain this ancient Vedic principle today? The modern world is one of global travel, a hectic pace of life, and large networks of friends and acquaintances. Eating outside—in restaurants, hotels, and airplanes—is a widespread social phenomenon, if not an obligation and necessity. How can we maintain our Krishna conscious principles in the face of this? Indeed, it would have been very difficult in ordinary circumstances. 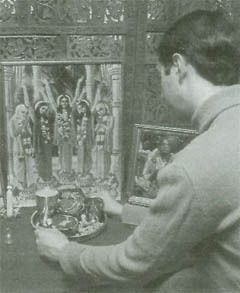 But by Srila Prabhupada’s mercy, it’s not impossible. Let me give you an example. My father travels frequently on business trips around the world. His company provides him with airfare, hotel rooms, and money for food. But while his colleagues may go to the nearest restaurant to have lunch, my father has to make his own arrangements. Sometimes finding a good meal is difficult, especially when prasadam from home runs out, so he eats only raw foods—fruits, salad, nuts. But when the need is greatest, Krishna always helps, and somehow or other he will find the local ISKCON temple, a Govinda’s Restaurant, or the home of a devotee. So he can eat prasadam almost anywhere he goes, and he can rest assured the food was cooked with devotion and offered to Lord Krishna.